ParkwayLife REIT’s FY18 DPU of 12.87 Scts was 3.7% above our FY18 forecast due to better operating performance and acquisitions. Singapore and Japan revenue backed by inbuilt rent review mechanism. We maintain our HOLD call with an unchanged Target Price of S$3.05. PARKWAYLIFE REIT (SGX:C2PU)’s 4Q18 revenue grew 3.7% y-o-y to S$28.6m although distributable income fell 2.9% y-o-y to S$19.8m (DPU: 3.28 Scts, -2.9% y-o-y) due to absence of divestment gains. Stripping out one-offs, distributable income would have expanded by 3.9% y-o-y (DPU: 3.28 Scts, +4.1% y-o-y) on better operating performance and acquisitions. FY18 DPU of 12.87 Scts is slightly above our projections, at 103.7% of our FY18 forecast. ParkwayLife REIT revalued its portfolio value up by 4.4%, boosting adjusted BV to S$1.85/unit. Singapore hospitals FY18 revenue and net property income grew 1.7% y-o-y to S$67.5m/S$64.4m as NPI margin remained stable at 95.3%. The expansion at topline came from a higher minimum guaranteed rent of 1.38% as well as higher rent contribution from Parkway East Hospital. Looking ahead, we anticipate Singapore contributions to grow steadily, backed by the annual inflation linked CPI +1% rent review mechanism. More than 96% of FY18 Japan revenue was derived from its nursing homes portfolio, which benefitted from additional contributions from an asset purchased in early 2018 as well as full year income from properties acquired in FY17. This was partly offset by the depreciation of the yen against the Singapore dollar. With 80.5% of Japan revenue having a rent review structure every 2-5 years with downside protection, and its Japan income largely hedged with yen forward contracts to 1Q23, we expect contributions from this segment to be well supported. 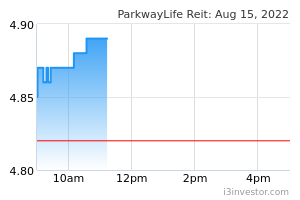 ParkwayLife REIT's interest expense for 4Q fell 12.7% y-o-y to S$1.65m on lower effective funding cost. Gearing stood at 36.1% as at end-4Q18 with no major refinancing needs in FY19. Its current all-in cost of debt is at 0.97%. Based on a 40% target gearing, ParkwayLife REIT would have debt headroom of S$121.5m to tap potential inorganic growth opportunities. We raise our FY19-20 DPU estimates by 2.6-2.7% as we fine-tune our interest rate assumptions and introduce FY21 forecasts. We maintain our DDM-based Target Price of S$3.05. ParkwayLife REIT offers investors stable yield backed by its defensive income structure. In terms of valuation, ParkwayLife REIT is trading above its +1s.d. dividend yield. Hence, we would be buyers on share price weakness. Key catalysts include accretive acquisitions while downside risks include deflationary periods where Singapore rent reviews would revert to 1%.